At the beginning of August I put an email round my contacts on Arran stating that I was getting "mixed messages" on the breeding success of House Martins on Arran this year, with some people saying they had had more nests than ever and others saying they had had a big reduction in the number of nests. 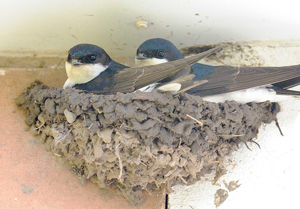 I asked for the observations of people who had House Martins nesting on their buildings or in the area. In particular I was interested in the number of nests in 2014 compared to the number of nests in 2013.If they had an idea of the number of broods raised and the number of birds fledged that would be bonus.I was encouraged when more than thirty people responded before the end of the month. From the observers who were able to provide information from the previous year forty percent reported more nests, thirty-five percent reported fewer nests and twenty-five percent reported the same number of nests. Within our settlements and villages there was some indication of movement from one site to another. Reported hazards facing these summer visitors which have travelled from south of the Sahara to breed included their mud built nests collapsing, House Sparrows evicting the House Martins and, most worryingly of all, humans destroying nests. Nests were hosed off walls and knocked off walls while they were being built or in some cases in use. Some of the observers had photographic evidence of this. They have been encouraged to report this criminal activity to the police. Under the Nature Conservation (Scotland) Act 2004 it is an offence to intentionally or recklessly damage or destroy the nest of any wild bird while it is being built or used. There was one other hazard reported, a Barn Owl attacking a nest. The occupant of a house backing onto farmland was aware of a noise outside the upstairs bedroom window. It was around midnight. With the room light out, the curtains were opened. A Barn Owl was flying up against the house, almost hovering. The House Martins in the nest were vocal. After less than a minute the Barn Owl flew off. In the morning the remains of the nest with two dead chicks were on the ground. I can find no other reports of this happening. An account has been sent to the Scottish Ornithologists' Club. Despite the hazards, from this small snapshot of data Arran seems to be retaining a population of House Martins. This is also reflected in our local bird atlas, Arran Bird Atlas 2007-2012 available from outlets round the island. 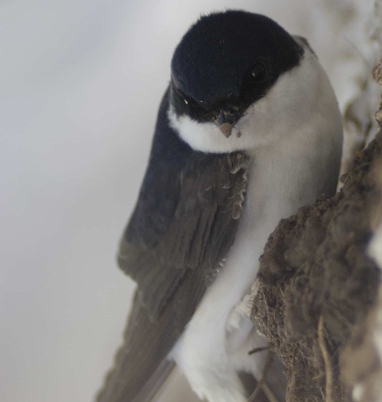 Nationally the House Martin population seems to be in decline. It is one that the British Trust for Ornithology (BTO) is particularly interested in. It is amazing to think that so little is known about the House Martin. It is, after all, a species that breeds alongside us, using our houses, bridges and other structures as places on which to construct beautifully sculpted nests made of mud. There is virtually no information on where UK House Martins spend the winter and breeding population information is incomplete. The information that the BTO has, suggests that House Martin populations in the UK may have declined by 15% over the last decade and may have fallen by as much as two-thirds in the longer term. 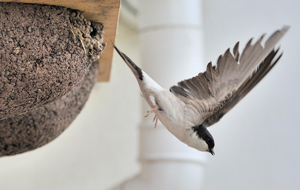 The BTO intend to deploy geolocators on some House Martins to shed light on where in Africa they actually winter. In addition, the BTO intend over the next few years to involve volunteers to collect information on breeding, including colony turnover and habitat preferences. There is more information on this link BTO House Martin Project 2014 | BTO - British Trust for Ornithology http://www.bto.org/volunteer-surveys/house-martin-survey/house-martin-project. Part of this development work required the testing of field methods this summer and one Arran volunteer has taken part in this. With the encouraging response of the people of Arran to my enquiry last month, reflecting an obvious interest in this bird, the developing BTO survey may be one that people in Arran would be willing to take part in.